No matter how large or small, taking every task to heart is what has helped us become the most established and trusted gutter installation contractor in the region. We apply our decades of experience and top-notch equipment to your situation to give you the best outcome. Our award-winning service speaks for itself. Our dedication and expertise are why we were named Best of Home Advisor™ for gutter installation in 2013 and 2014. Since 1979, our gutter installation company has been providing home and business owners throughout the area with outstanding service and selection, all at competitive prices. Keep your home's foundation intact with our help. We have the skills to prevent water damage and its associated problems. Call us to schedule a service from our gutter installation contractor. We install or service your gutters, including seamless and rain gutters, gutter downspouts and screens, and gutter covers. In addition, we offer free on-site estimates and provide an impressive variety of color options for all types of gutters, such as copper, aluminum, and PVC. We make sure to match your personal tastes with a practical solution for your home repair needs. 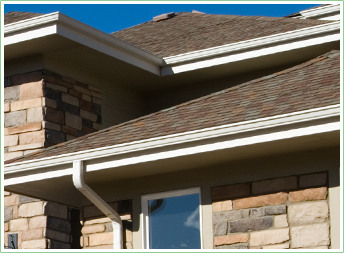 Depend on a gutter installation company in Houston that has your satisfaction in mind. We provide home and business owners throughout the area with outstanding service and selection at an affordable price. Today, more than 35 years later, reaching this goal each day is still just as important. How do you know you need new gutters? For starters, it is most important to replace your gutters when you notice there are holes or other significant damage done to your gutters. In addition, it is important to replace your gutters if you get significant roof repairs or a replacement. Not only could your roof’s changes alter how water flows, but the roof and your gutters might not match as they did before. If your home does not have gutters to begin with, then it is definitely time for you to give our team a call for top-quality gutter installation. When you trust a local company like ours, you can rest assured that we keep your needs and preferences in mind. Our team understands that your satisfaction is vital to keeping your business going, thus we place it as our top priority. From the moment we meet you at your door to perform your service to the moment we pack up and leave, you can expect an enjoyable experience. Any time you schedule a service with our professionals, you can take peace of mind knowing we will respect your property as though it were our own. Many customers have had negative past experience with the repairs and installations they receive to improve their homes. We make sure to thoroughly tidy up after we are finished with our work so you do not have to lift a finger. Everything we do is performed meticulously so you do not have to worry about your gutters. We know what it is like to deal with gutter issues, so we always keep our charges fair and competitive, to ensure your home is kept safe. You will never pay too much when choosing our fully insured gutter installation company. We're willing to match any price that the competition offers. Furthermore, take advantage of a limited lifetime labor guarantee. This proves far superior to those one or two years most companies offer. After that, we offer a 50-year material guarantee where applicable. Contact us to schedule a free estimate from our gutter installation company. We're available for residential and commercial customers in and around Houston, Tomball, Cypress, The Woodlands, and Spring, TX.